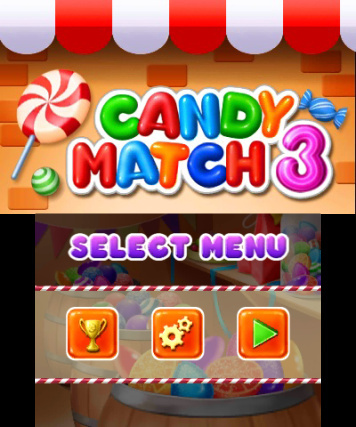 Start Candy Match 3 up and its cheery-looking title screen greets you with… complete silence. Your ears may pick up nothing, but your soul should be hearing the dire warning screeched out by the very void: abandon all hopes of creative or original effort, ye who enter here! Match-three games feel like an oft-visited well, but there isn’t much wrong with that in itself as long as new titles seek to push the envelope or shake up themes. Candy Match 3 has one mode, on one board, with one difficulty level, and it’s the same style of marathon play that’s been repeated ad infinitum since the very start of the genre. 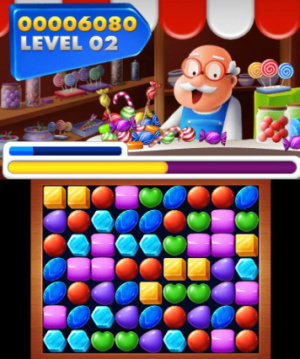 Players, still working in silence save for sound effects, swap seven different colours of very hard-looking candies on the lower screen to create matches of three or more. Matching more than three will create special candies that can eliminate others in the surrounding area, along rows and columns, or all of a specific colour. “Stone candies” (which look just like stones and aren't even rock candy! ), will sometimes appear and block up the works until eliminated by a special candy. All the while during play, a timer bar is counting down. Each match nudges it back up a smidge, while making enough matches to fill a smaller bar will add back a larger chunk of time and boost play up a level. This is accompanied by a small fanfare to prove that your 3DS has not lost its capability to play music. That’s really all there is to it: keep on matching like crazy and rack up the best score possible until the timer runs out or you just don’t feel like doing it any more. High scores are saved to a leaderboard, but it is limited only to local play. The closest one might get to challenging others is by posting their scores to Miiverse. Having to adhere to a timer feels like it should be exciting, but really comes off as annoying more than anything else. Planning out the satisfying chains and cascades that can be formed in games such as this just doesn’t feel feasible when the constant threat of time is breathing down your neck. An alarm also serves as a warning when time is close to running out. Get used to hearing it constantly when in that range, as making matches by themselves rarely boosts the timer up enough to get out of it. The theme, while run well into the ground, is at least colourful. An old man in a candy shop will watch you from the top screen as you play, and from his reactions he really loves it when explosions go off. 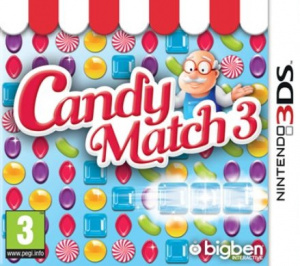 With a very limited scope of play, bare-bones pizzazz, and absolutely nothing new to show for itself, Candy Match 3 only seems to fit the niche of a time-waster to occasionally pull out for a brief play. It functions, but when the exact same experience can be found elsewhere, and for more reasonable costs, the $7.99 price tag on this bland offering is simply ludicrous. Save your teeth for something sweeter. But the old man on the upper screen looks so cheerful! Buying an extra DS so I can have 2 copies of this. Wanna know the best part?This game was deemed fit for a retail release in Europe. @Stu13 I hope you're kidding. This game isn't really worth the investment. @FalconPunch: He better be, lol. 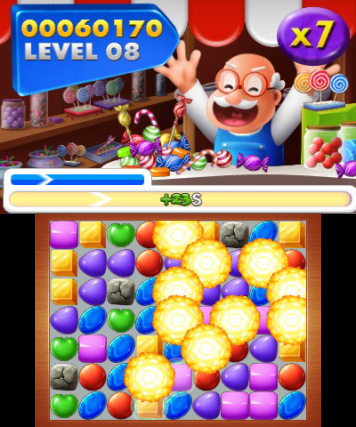 And so, Candy Match 3 joins the hundreds of other shovelware games made for Nintendo Systems! It would have been funnier, and more relevant to the headline, if it got a score of "1". "How many licks does it take to get to the centre of this game? One." Obviously the answer is 2 !!! I'm getting a toothache just looking at this game. 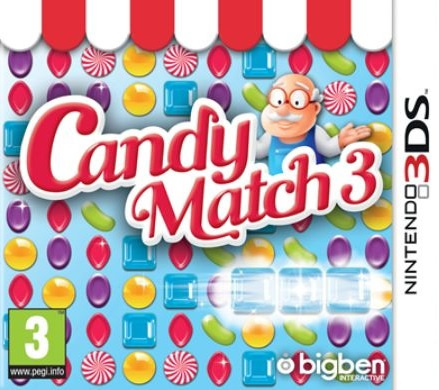 Can we hope for a Candy Match trilogy collection? Wait, wait, wait, so there's NO music? Like...NO MUSIC AT ALL?! At least you can't say it's not innovative? Wait: How many licks does it take to get to the centre of this game? One. The name of the game "Candy Match 3"